After visiting Austin in March, I slowly made my way back with a week-long pit stop in Boulder, CO on my way to Seattle to spend a month with family and friends. On May 31st I flew to the big island of Hawaii with my hiking pack full of a clothing and camping gear, my laptop bag, and my road bike boxed up for re-assembly on arrival. The plan was to arrive and stay with my friend Alice on the farm she was staying at in Pa’auilo, less than an hour north of Hilo. Unfortunately things fell apart on the farm she was at just days before arriving which lead to hear leaving the farm. That mean’t I had with no place to live and no vehicle to use when I arrived. We quickly rented a minivan and began the process of collecting her things and figuring out our next steps. I was along for the ride at that point. 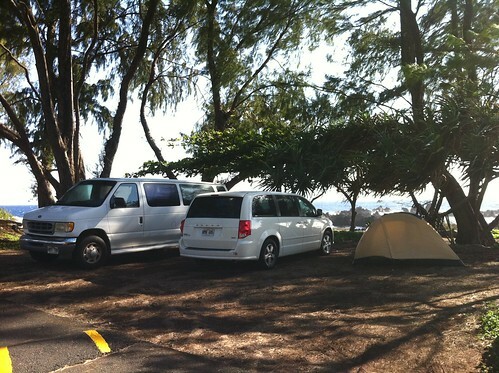 We camped at local beaches north of Hilo tenting and camping in the van after we figured out how to literally fold both rows of seats into the floor. As much turmoil as there was, it was a lot of fun exploring the coast, meeting her friends, trying new foods, foraging for coconuts and taking in the beautiful landscapes. Five days after arriving, we found and Alice purchased a 97 15-passenger Ford van. 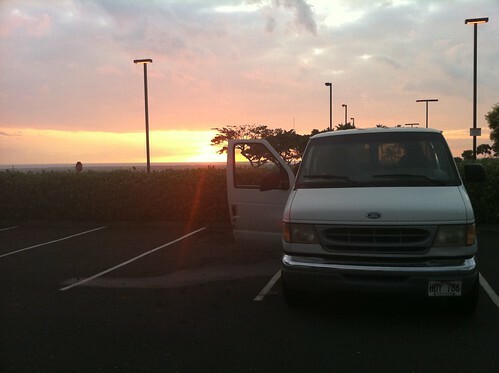 We spent the successive week around Hilo gutting the seats, sanding out rust, and cutting a base layer of 3/4″ plywood (most of which we did in the Home Depot parking lot ;) ) to serve as a base for camping in and any future conversions we made to the van. From there, we headed North to the top point of the island to check out a possible work trade opportunity I had learned about from my coworker David. We showed up on what we later learned was one of the rainiest days of the year and toured the property. The place was several acres on the hill pretty high up from the ocean sloped and looking out over the water straight at Maui. The owners are known for their meditation seminars they do with corporations around the world and their own dharma and mediation teachings. The property held a house used by the owner, an out of sight house built by and used by the caretaker, a fairly large yurt with extravagant attached decks and attached indoor kitchen, an area with a cooking facility and small building for use by work traders, and a bath house near the orchard where there is a tent platform and space to put up tents during yoga and meditation retreats. The property was spread out and littered with a beautiful arrangement of ornamental plants and flowers as well as a garden and multiple tree orchards where dozens of varieties of fruits were growing notably including varieties of avocado, orange, mango, papaya and banana. The owners were only there about half the time and wouldn’t arrive for another month with the only people on the property being the caretaker with his wife and son, one guy doing a work trade and a temporary guest paying to stay in the yurt. It seemed like a perfect place to spend a few weeks or more, but with the 20 hour a week commitment required of us to use the property I wasn’t in a rush because I was still working part time doing web development remotely with my coworkers 3 hours ahead in Seattle. 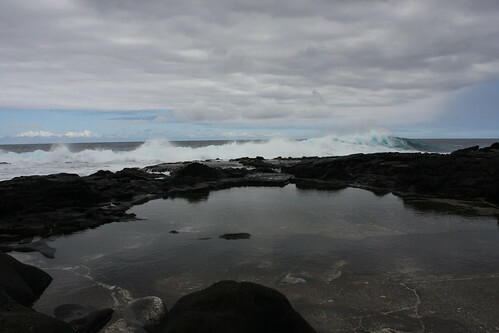 We spent the next week exploring the northern point then driving down the Western coast of the island to Kona and then further south to Captain Cook area. We stayed at a bunch of parks and scoped out the camping opportunities in the area. I got some work done during all this but we were both ready to stabilize for a while, especially after all the changes Alice was going through after her previous work trade situation. 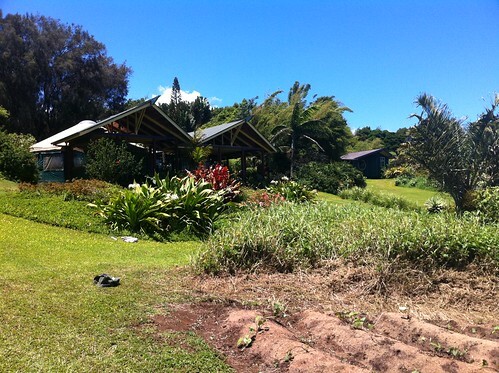 We headed back up to Hawi and spent the next month working on the property and relaxing in one of the best spots on the island. We were on the water where the weather was beautiful and sunny almost every day but where the plants got tons of moisture to grow like crazy (the environment changes drastically as you circumnavigate the island). On the property, we set up a pretty large tent on a covered tent platform in the orchard nearby the bath house and yurt platform. From the tent we were able to run an extension cord and access pretty fast WiFi broadcasting from inside the yurt. Now that’s camping! 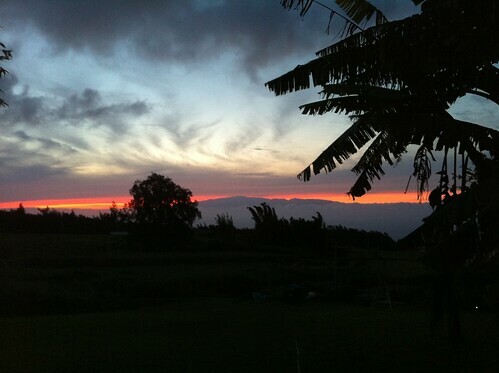 Our stay in Hawi was a great change of pace for me. Most days consisted of waking up around 8, making breakfast in the outdoor kitchen then meeting up with the caretaker Brad and the other work trader Tad for a 3-4 hours of work on the property, stopping at lunch to cook and eat on the yurt deck, followed by a shower and relaxing on the property for the rest of the afternoon. My afternoons were pretty heavily occupied by work but I managed to get a lot of reading in too during our time there. At times it felt hectic, but all in all it was a really nice flow. We spent our work hours weeding, trimming humongous spider lilies, maintaining other similar plants that grow like crazy in Hawaii, spreading compost, grading and planting a sweet potato patch and vegetable garden, trimming and cleaning up the existing gardens and random cleaning and tidying of the property. Other than at one point where I accidentally bust open a high pressure water line with back hoe, the work was pretty routine ;). Throughout the days and before meals we’d harvest fruits and vegetables from the property. I ate significant amounts of avocado, fresh kale and collards picked for stir frys, lots of lilikoi (passion fruit), fresh picked oranges that I harvested directly from the trees, some papaya and other random fruits and veggies as they were available. We took several trips down to Kona while we were there, mostly for repairs to our computers (long story), but spent most of our time around Hawi. They had an amazing delicatessen with delicious whole wheat hot pretzels with a honey-horseradish-cheese sauce that I still think about. The town was very small with only about 3 blocks of businesses on one street, but the community was great. Brad, the caretaker, played music down at the local Kava bar a few times where we drank kava and socialized with locals. The town also had a great Sunday farmers market under this humongous Banyan tree in downtown where we got some fruits and veggies and I had some of the best mangoes on my trip. Other than hanging around Hawi, we took several trips to local beaches for swimming, went and watched a yearly ceremony where they released turtles into the wild, visited a mushroom farm to pick up loads of mushroom compost, and visiting other local friends of Brads where we were able to harvest tons of lilikoi. After the owners arrived almost a month into our stay, I was feeling more than a little bit of anxiety while juggling work trade and paid work and wanting to explore the island. 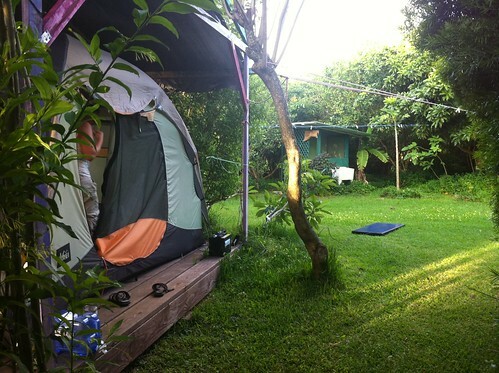 Alice started to feel a desire to move on as well, so we decided to leave Hawi after about a month on the property. After Hawi, we weren’t sure what was next. I knew I needed to up my work hours and we had a number of specific places we wanted to visit, but weren’t sure exactly what the plan was. The grand idea of the trip from before I flew out was to explore the island slowly while working here and there. As it turned out in practice, it was difficult to work from the van logistically due to power and access to internet (even 3g was non-existant at most parks). We also soon came to discover after driving south to Oceanview that though there are a bunch of county parks on the map, most are pretty much exclusively used by locals and not very welcoming to white “tourists” like ourselves. It was a frustrating first week as we realized it wasn’t going to be like the idillic idea we had envisioned it to be. We spent the next couple weeks stationed mostly out Starbucks where we both got a lot of work done, but the Hawaii life was losing its appeal as we found it increasingly difficult to find places to camp out and spending all day at Starbucks wasn’t really what either I or Alice had wanted to do indefinitely. We made some improvements to the van by installing curtains and mounting Alices solar panel on the roof with a crafty rack we designed, though, which made the rest of our trip a bit simpler logistically. We put together a plan to visit the rest of the island before concluding our trip, put in a few more days of work, then headed out South with tourism as our goal. We paddled to Captain Cook’s monument, did a bunch of snorkeling, swam with spinner dolphins spontaneously one morning while camping, explored the local beaches, visited the observatory at Mauna Kea then headed to Volcanoes National Park for a week. Volcanoes was awesome and way better than I had imagined. With how much the terrain changes around the island, I thought it was going to be all desert, but it was surprisingly lush and during our time there the weather was phenomenal most of the time. We camped in the park at a little campground with very little traffic that was quiet and a nice home base while we explored the park. 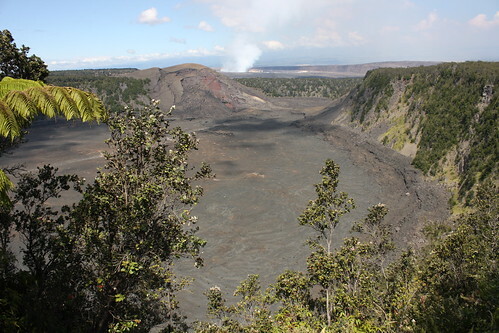 We hiked in craters, saw the steam vents, visited the many trails of cooled lava flow that scour the park, walked in lava tubes and watched the distant glow of lava from the active crater in the park while the sun set. It was a great time and I will definitely be going back eventually. While in Kona the second time, we had decided the end was in sight so we put all our efforts toward selling the van and making progress on work and projects while we waited out the selling process. We hung around Kona patiently for a few weeks until we sold the van, working at cafes, visiting beaches and taking a trips to Hawi and Honokaa again to visit a few more of the sights. We attempted to watch the Perseids meteor shower from Mauna Kea, but unfortunately it was too cloudy to see more than a few random trails. Eventually we found a buyer, a middle-aged woman looking for a safe and reliable van set up for camping and living out of then flew out the next day! It was a fantastic trip. View the full Flickr set!